When sahti and other ancient farmhouse ales originated? What did the Vikings drink? Was all pre-industrial beer sour? History of farmhouse ales is full of interesting questions, and to find answers the history of beer in Europe need to be largely addressed. I will focus mainly on the homebrewed Nordic and Baltic farmhouse ales like sahti, but to some extent this text also concerns Belgian and French farmhouse ales. Low alcohol small beers like kalja or kvass are left out, but their history is partly covered in Small Beer Called Kalja. The following text assumes that you know the basic features of farmhouse ales, as explained in the introductory text Sahti and Related Ancient Farmhouse Ales. What European farmers brewed for their own use was recorded relatively late. For example, the first written description of sahti is an academic study of Carl Niclas Hellenius from 1780. Archaeological evidence gives some clues, but wooden brewing gear and organic ingredients have not been preserved well. Inevitably the origins of these farmhouse ale is shrouded in mystery, and this is my scenario how these ales likely evolved. Archaeological finds suggest that the most ancient beers made several thousand years ago in northern Europe often combined various sugar sources, such as grains, berries and honey. These drinks were sort of hybrids of beer, mead and wine, called Nordic grog by the “beer archaeologist” Patrick McGovern. The header image of this story shows one such finding: birch bark bucket found from a burial in Egtved, Denmark dated to 1500–1300 BC had contained a Nordic grog made from wheat, cowberries, cranberries and bog myrtle. From the texts of Roman historians it is clear that two thousand years ago Germanic and Celtic tribes were imbibing a drink clearly identified as beer. In the first century AD, a Roman historian Tacitus wrote that Germanic tribes brewed beer from barley or wheat, and were inclined to feasting and getting drunk. For more details, see Max Nelson’s book Barbarian’s Beverage. Later in the first millennium, the Vikings (750–1050 AD) made beer, especially from barley, and had also a habit of feasting with large quantities of beer. In the first millennium brewing in Europe was a household craft, largely some kind of farmhouse ale. However, from the 9th century onwards, a more professional and larger scale brewing were developing in the European monasteries. In the 12th century large scale commercial production of beer started to gain a foothold in European towns, and the rise of hopped beer begun from Germany. Boiling the wort with hops made beer store better, and by 13th century brewers in northern German towns were already exporting their beer to other countries. Within few centuries boiling the wort with hops became the norm in commercial breweries across Europe. Historian Richard W. Unger describes this evolution well his book Beer in the Middle Ages and the Renaissance. Due to this change, the paths of farmhouse ale and and urban commercial beer begin to diverge in the early second millennium. The commercial beer was highly taxed and regulated. The competition of brewers favored development of the brewing process, more capital, and bigger scale. 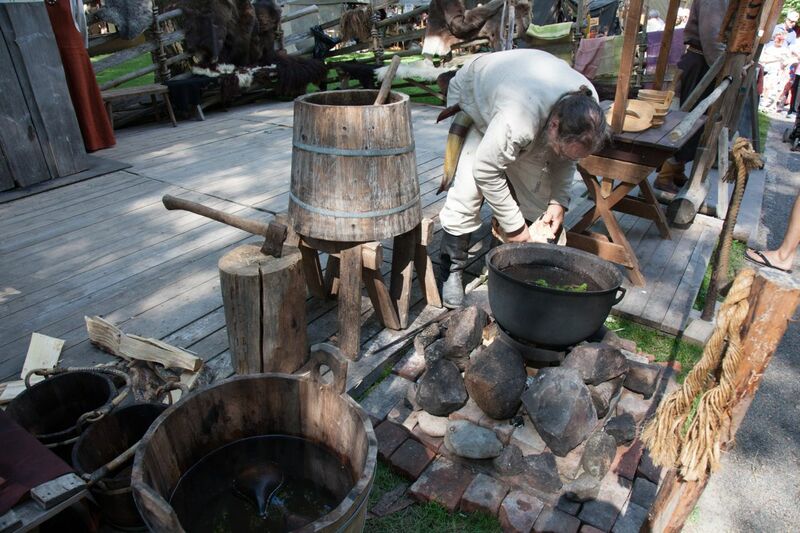 The farmhouse brewers continued to the brew with archaic methods for their own use. Some farmhouse brewers begun to boil their wort with hops as soon as they could afford to buy big copper kettles, perhaps from 17th century onwards. This happened for example in Belgium and France, leading to farmhouse ales known as saison and bière de garde. Gradually the commercial beer made on a bigger scale begin to supersede farmhouse brews, especially in the more populated and central areas. In many parts of Europe brewing was licenced, and farmers were not always allowed to brew. The archaic farmhouse brews survived better in more rural and remote areas. The survived Nordic and Baltic farmhouse ales sahti, koduõlu, gotlandsdricka, maltøl and kaimiškas are remains of a larger culture. Likely similar ales were once brewed also elsewhere in northern Europe, and perhaps evidence on this waits to be found in the historical books and archives. Let’s rewind back to Germanic tribes, the Celts and the Vikings. How close their ales were to Nordic-Baltic farmhouse ales brewed today? Direct evidence tells mainly that the Germans, Celts and Vikings favored malted barley and brewed beer in large quantities for feasts. A quick math and history exercise: how much a shipful of Vikings need beer for a feast? The Viking warships had a crew of around 20–50 men. I would say they need 100–200 liters of beer, which is even today a traditional farmhouse ale batch size in the Nordic and Baltic countries. Brewing that amount of beer with the first millennium technology is not obvious. Metal cauldrons were known, but back then big kettles were very rare and expensive. Arguably the Germans, Celts and Vikings brewed using wooden tubs and trough-like vessels, like some farmhouse brewers today. Likely they were not boiling their wort either, and why would they? Likely they didn’t know that beer from boiled wort stores better, and all the beer was drank in the feast anyway. Juniper seems to be much older brewing herb than hops. Patrick McGovern and his collaborators found juniper from the residues of ancient Nordic grogs from Juellinge (around 200 BC), and Kostræde (1100–500 BC) in Denmark. Likely also the Vikings spiced their ales with juniper, along with other herbs found in those grogs, such as bog myrtle and yarrow. There are some indirect evidence of hopped beer in the 9th century Europe, but widespread use of hops in brewing before 12th century seems unlikely. For more information see Martyn Cornell’s A short history of hops. I haven’t seen many references about Viking Age maltings, but my understanding is that the Vikings dried their malts in kilns by channeling the smoke from wood-fired stove through the malt bed, pretty much like a farmhouse brewer Morten Granås in Hegra, Norway is still making his malts, see Lars Garshol’s story Hegra maltøl at Granås Gård. Merryn and Graham Dineley’s article The origins of the Viking bathhouse myth gives also good background for the Viking Age malting. Did the Vikings have house yeasts, and were they able to avoid sourness by controlling fermentation? These are difficult, if not impossible, questions to answer. Although the secrets of yeast and fermentation were revealed as late as 19th century, brewers started to control fermentation by reusing yeast centuries before the laboratory discoveries. When exactly this happened, we don’t know. Richard Unger states in his book Beer in the Middle Ages and the Renaissance that brewers were already reusing yeast in the 14th century. Based on several sources it is quite clear that by 16th century yeast reuse was a common practice, and many brewers were making sweet or bitter beer which went sour only by accident, as Lars Garshol argues in his article Was all beer sour before Pasteur? In conclusion, my claim is that in the feasts the Vikings drank farmhouse ales somewhat similar to the Nordic and Baltic Farmhouse ales we know today. No doubt the Vikings drank also low alcohol ale in their everyday life, but their feasting ale was stronger and intoxicating. Their malting and wort making practices as well as brewing vessels were apparently similar. Likely the Vikings used juniper and few other brewing herbs instead of hops. Perhaps fermentation was more primitive back then. Although today’s Nordic and Baltic farmhouse ales are not brewed exactly the Viking way, they offer a fascinating view to the early Medieval or the Viking Age brewing, and thus to the history of beer. These ales are the best surviving examples what European beer was like before the principles of modern brewing were established in the Middle Ages. A Finnish brewery Lapin Voima research ancient Nordic brewing methods and then demonstrate them in practice. The beers are sold in beer festivals and medieval fairs. This is their brewing show at Turku Medieval Market 2016. Photo by Sami Brodkin. McGovern, Patrick E. (2009). Uncorking the Past: The Quest for Wine, Beer, and Other Alcoholic Beverages. University of California Press. Nelson, Max (2005). The Barbarian’s Beverage. A History of Beer In Ancient Europe. Routledge. Unger, Richard W. (2007). Beer in the Middle Ages and the Renaissance. University of Pennsylvania Press. Haggrén, Georg, Halinen, Petri, Lavento, Mika, Raninen, Sami and Wessman, Anna (2015). Muinaisuutemme jäljet: Suomen esi- ja varhaishistoria kivikaudelta keskiajalle. Gaudeamus. Price, T. Douglas (2015) Ancient Scandinavia: An Archaeological History from the First Humans to the Vikings. Oxford University Press. Wolf, Kirsten (2013). Viking Age: Everyday Life During the Extraordinary Era of the Norsemen. Sterling. The Viking Answer Lady site offers a nice view on alcoholic drinks and drinking customs of the Vikings, although it is not exactly a scientific reference. This story was originally published in September 2016 as part of my Introduction to the Nordic and Baltic Farmhouse Ales. The introduction grew very long and in January 2017 I worked the history into its own article. The introduction was renamed to Sahti and Related Ancient Farmhouse Ales.